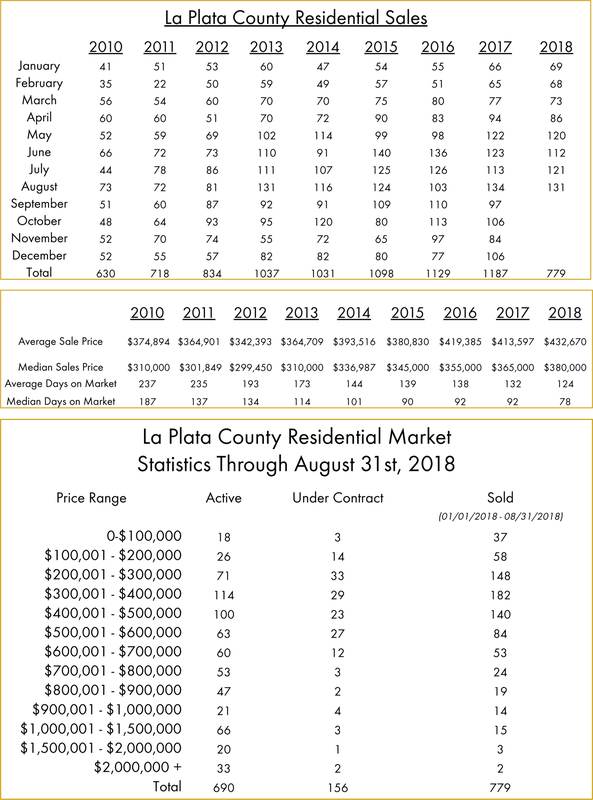 This week we have the August La Plata County residential real estate transaction numbers. With 131 total sales, it was higher than last month, and just short of the total from August of 2017. Year to date, we are at 779 total sales. Last year at this time there were 794 total sales. So, this has been a solid year, although slightly behind last year’s numbers year to date. The median sales price is $380,000. This is higher than any year since prior to 2010. The average days on the market is 124, which is lower than any year since prior to 2010. As we have noted recently, there is a fast sales cycle and high median price, even if there are fewer transactions this year compared to last year. Overall, it was a great month for La Plata County real estate. Historically, we tend to see strong activity in the fall months, and would expect a similar trend this year. As always, please let us know if you have any questions on the La Plata County real estate market! We will be hosting an open house this Saturday from 10-12 at 186 Pioneer Avenue. We would love you to stop by and say hello! Previous: Previous post: Local Durango Events—Something for Everyone!